This entry was posted in Buckles, Chip Inlay and tagged belt buckle, chip inlay, chip inlay buckle, native american, peyote bird, symbols, tipi by Native American Jewelry Tips. Bookmark the permalink. Hi, This is a beautiful buckle but I’m suspicious of it. As Paula said, Tommy Singer was credited for having first thought up chip inlay, sweeping up the chips of leftover turquoise and coral from the floor after the stones were cut and buffed. Well, the reason he stopped doing it is that Asians copied his work and undermined the whole market for the style. He had a company that made a lot of it. He only signed the best of it from his shop. And he used different hallmarks too. 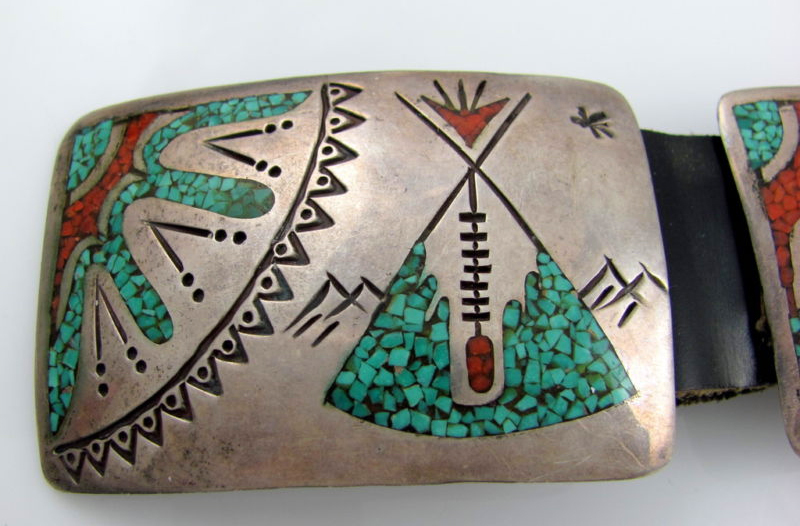 I have owned many of his pieces and all the symbols in your buckle are symbols HE used in his pieces, but I really know his work of this kind and could post pics if I could post pics… this work is not his even though it bears similarity to his and uses all the symbols he used. For this reason I think this might be one of the Asian imports, one of the copies of his work. 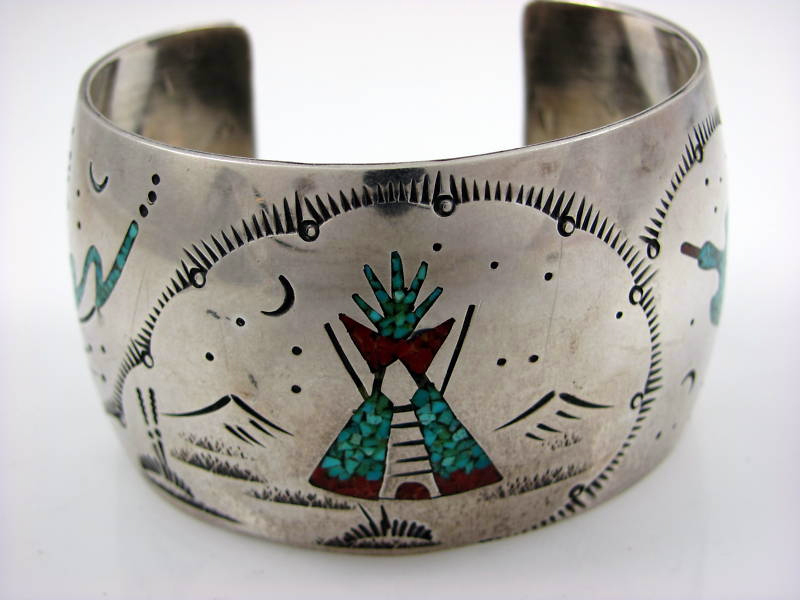 I could be wrong about this and if you have a solid provenance for at least it being a Navajo work, I would be happy and would say I’m wrong, but without a provenance I’m just being cautious about this one. It doesn’t make the work less beautiful. Your piece has almost an Art Deco feel to the simple patterns that are used, which is elegant. But there is also a smoothness to the inlay in comparison to the piece Paula is showing us and that lack of smoothness is “right” to my eye. I hate to bear this sort of news. Interesting and thank you for your insight and opinion as always Linda. Maybe Albert will send more information such as where he obtained it and any other details he might have. Did Tommy Singer use tipis like that on his chip inlay items? 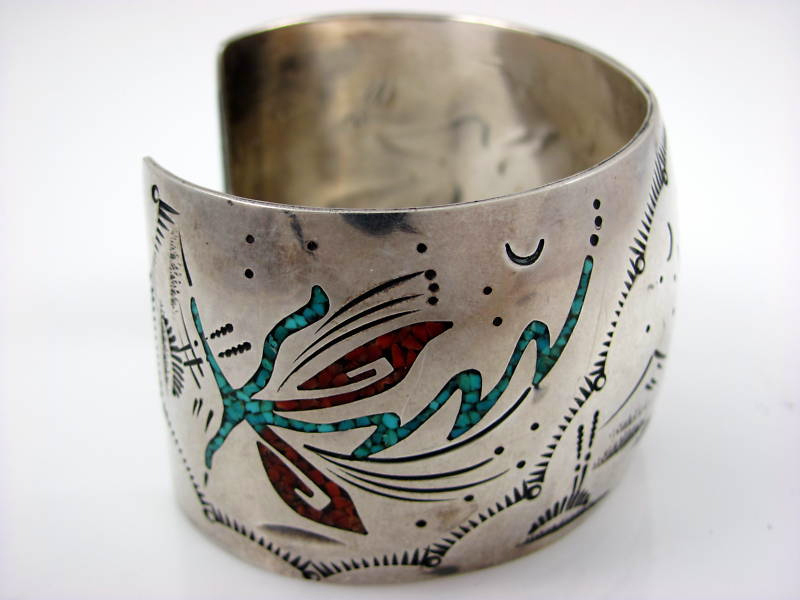 I can’t guess where this was made either but I DO think the design could be Navajo or from Oklahoma. It uses all the symbols of the Native American Church, Peyote bird, Tipi, moon, star, and others. What is the metal? Silver? Nickel silver (white brass)? Can you tell if it is made from 2 sheets of metal creating the overlay by cutting out the design in the upper sheet. I also don’t think it is Asian made. The size and type of the chips is nicer than I used to see on imported goods. 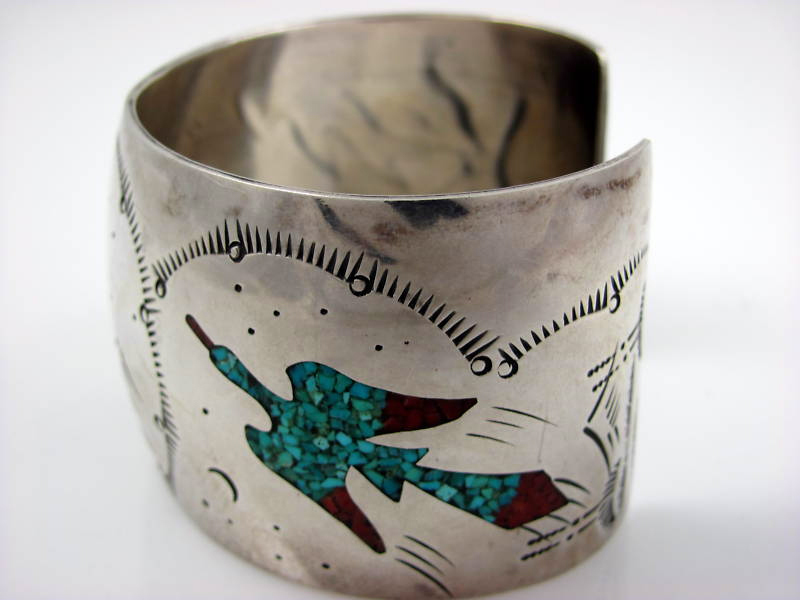 Tom Singer, Margie Dodge and the other chip inlay artists in the Dilcon School area did use the Tipi and the water bird. Many of the families are NAC members and use a lot of the typical NAC symbols. Peyote fan, rattle and water cup are sometimes used as well. Interesting ! Thanks for contributing what you know Russ. It is always very much appreciated. Yes, Paula: Tommy used all those symbols in pieces I’ve owned and sold. I’ll upload examples to you in email (save me the time of looking for your email address and shoot me an email and I’ll respond with some pics) and you can post them, when I have a minute. The style of his tipis were different than this. In fact the style of all these symbols were different than his even though he used every one of them. Russ made good points that it could have been made in an entirely other area and not necessarily an Asian copy. I sent you a bracelet and a belt in two separate emails. They have all the symbols on this buckle and both are signed Tommy Singer pieces. He used all those symbols but the style is quite different. These are both pieces I sold in the past, so I just have the pics; not the pieces any more. Thanks for your contribution Linda. I posted the photos. Hi, just found this forum and would welcome some help identifying the origin of a buckle. My partner wants to replace the leather which she has worn out after some 30 years of wearing. She treasures this buckle and hopes to have the maker replace the leather, though I suspect we may have to get that done locally. Not sure how to attach a photo of the buckle. Any help would be greatly appreciated! Hello, Norman Thompson is my husband and he is the creator of this buckle. Tommy Singer taught him everything he knows about Silver Smithing. Norman started at age 14 under Tommy and he is now 60. Tommy had a ceremony for Norman when he was 17. The ceremony is a Navajo way of blessing and carrying on the knowledge he shared. In this Norman was given the honor and the responsibility to share the skills he learned from Tommy. He then taught his whole family of 10 brothers and sisters. That is when this buckle was made. Norman was very excited to see one of his buckles. He always wonders where his older jewelry has traveled. He did not put a mark on any thing made until 1980, so that is aprox. 5 years with out makers mark. He now uses a simple arrowhead for his mark. He is very particular about how the inlay is done so it resembles a mosaic pattern as opposed to the cheap inlay that is ground up.